By providing all your web pages with a meaningful page title, you help both users and search engines. Use a tool that can easily identify pages with missing titles for you. Make sure to provide these pages with a title, and also go through a selection of your existing page titles to assess whether they are descriptive enough for the content on the page. The first thing a screen reader encounters when a web page is opened is the page title. The title is an important element on a page for screen reader users, because it informs them of the content they can expect to find on the page. By providing your web pages with meaningful titles you are in conformance with WCAG success criterion 2.4.2 Page Titled: "Web pages have titles that describe topic or purpose." Create a link that is present on all your web pages as the first element on the page. This link should take the user directly to the page content (skipping for instance the global menu). This way users with visual impairments, motor impairments and other types of users using a screen reader, or who navigate from the keyboard alone can skip repeated blocks of information. You can hide the link visually on the page if you like, as long as it's still visible when it receives focus. (e.g. highlighted when a user presses the "Tab" button). By helping users who cannot use a computer mouse you are in conformance with WCAG success criterion 2.4.1 Bypass Blocks: "A mechanism is available to bypass blocks of content that are repeated on multiple Web pages." Go through your main page and your template pages and assess whether the images should have alternative texts. The code for alternative text (alt="") must always be present for any image, however, if the image is decorative the alt text field can be left empty. If the image conveys information that you would not know without seeing the image, then this information should be written in the alternative text. If the image is a link, then describe the destination to where the link takes you. When working on alternative texts for images, you are conforming with an essential part of WCAG success criterion 1.1.1 Non-text Content: "All non-text content that is presented to the user has a text alternative that serves the equivalent purpose (with a number of exceptions)." 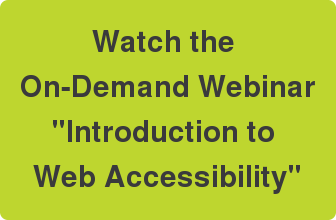 To get started with web accessibility, watch the on-demand webinar "Introduction to Web Accessibility".